Joe Martin began his martial arts and healing work in the early 60s. He has studied many martial arts, bodywork techniques natural healing methods over the years. Grandmaster Joe Martin began teaching Martial arts in 1965 as assistant instructor with Sensei Bob Alexander and has had special training from many great masters from around the world. His knowledge of internal power and its application in martial arts will transform your art to a level far above your expectations in just a few hours. Grandmaster Martin teaches extraordinary workshop to instructors and students. Grandmaster Joe Martin has had specialized training in Texas, New York, California, Europe, Canada, and China. 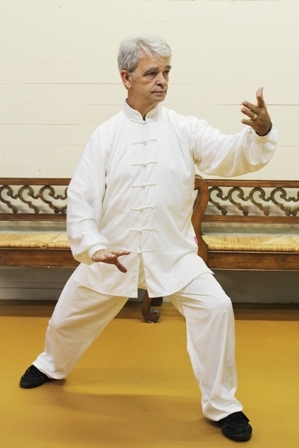 Many of the extraordinary secrets taught in the workshop at CHI were handed down to Grandmaster Martin’s teacher, Mantak Chia by a Taoist monk (Master Yi Eng). It was Master Cheng Yao-Lun who taught him the Shaolin Method of Internal Power that was regarded as a national treasure of China. Certified full instructor by Healing Tao USA & Universal Healing Tao International. This is the system developed by Mantak Chia. Certified Charka Technician by the World Institute of Technologies for Healing, a.i.s.b.l. Using a series of ancient meditative and internal energy exercises, one learns to increase physical energy, release tension, improve health, and acquire the ability to heal oneself and others. Chi Nei Tsang practitioners work mainly on the abdomen with deep, soft and gentle touch, to train internal organs to work more efficiently. All of the main vital body systems are addressed: digestion, respiration, lymph, nervous, endocrine, urinary, reproductive, integumentary, muscular and also acupuncture meridian system. No physical manipulation is involved in the use of our techniques. Only a light touch, if any, when it does not conflict with someone's philosophies or sensitivities. This is the Japanese word for "universal life force energy." It is an ancient approach in which the practitioner is a kind of healer in the sense that he or she serves as a conduit for healing energy coming from the universe. The Reiki energy enters the practitioner through the top of the head or the bottoms of the feet and exits through the hands, being directed into the body or energy field of the recipient. Reiki is a very subtle form of healing and may be done through clothing and without any physical contact between practitioner and "student". Your consciousness, your experience of Being, who you really are, is energy. We can call it "Life Energy", "Chi", "Ki". This energy does not just live in your brain; it fills your entire body. Your consciousness is connected to every cell in your body. Through your consciousness, you can communicate with every organ and every tissue, and a number of therapies are based on this communication with the organs which have been affected by some kind of symptom or disorder.